XIAOLU'S NOTES: It's fastest and easiest to use your hands to work with the cake mixture, so wash up and dig in! If you've never tried cake pops before, be prepared for a creamy, truffle-like consistency inside rather than a texture just like regular cake. Mix 1/3 cup of cream cheese into the crumbled cake with your hands, breaking up the cake as much as possible. Try to press and roll the mixture into a ball about 1 1/4-inches in diameter. If the mixture is too dry to make a smooth ball, continue adding and kneading in the cream cheese 2 tablespoons at a time just until the mixture will form a smooth ball. Line 2 large baking pans with non-stick silicone mats or parchment paper. Roll/press the cake mixture into balls 1 to 1 1/4-inch wide and weighing and about 28 grams each. (You want to press enough that the ball holds together when dipping later, but don't compress the cake too much or it will expand later and crack your candy coating.) Repeat until the remaining cake mixture has been used up (you should have between 20 and 25 balls), setting all the balls on one of the lined pans. Place candy melts into a heatproof bowl and microwave at for 1 minute on medium-high heat. Stir well, then continue microwaving at 30-second intervals on medium heat, stirring between each, until the mixture is mostly melted and smooth. Continue stirring (but without beating which will add unwanted air bubbles to your coating) until the mixture becomes completely smooth. Dip the end of each lollipop stick into a little melted chocolate and insert halfway into the middle of each cake ball. Transfer pan to the refrigerator to set the chocolate and firm up the cake balls (this is an important step that prevents cake balls from falling off the stick during dipping). Remove from the fridge after 10 minutes, and allow to warm up again for at least 5 minutes (dipping too-cold pops is main cause of cracked coating later on). Meanwhile, microwave your shortening on high for 1 minute, then add 1 tablespoon to your melted candy coating. Stir gently until evenly combined (if any streaks of shortening remain, they will be visible in your cake pop coating). Push a spoon down into the coating, and it should meet little resistance. If coating still seems too thick, add and mix in additional melted shortening (1/2 Tbsp at a time) until it's thin enough. Fill a clean, DRY mug with the melted coating up to 1/2 inch from the top. Dip an entire cake ball straight down into the melted candy coating until it is completely covered, and remove it in one straight upward motion. (If you stir it around, it is very likely that the ball will fall off the stick and you’ll be very upset, trust me =p.) Make sure the coating extends to the base of the lollipop stick. This helps secure the cake ball to the stick when the coating sets. Once you lift the cake pop out of the coating, immediately turn the pop so that the cake ball is pointing upwards. There will be extra coating still on the cake ball that you need to remove. Hold the cake pop in one hand and use the other hand to gently tap the first wrist. Rotate the lollipop to allow the excess coating to drip evenly back into the mug, but never let the stick tilt too far down or the ball may fall off. If too much coating collects at the base of the lollipop stick, you can wipe the excess off with your finger. When most of the extra coating has dripped off, turn the cake pop over again so that the ball is down and the stick is up. Place the pop with the cake ball side down onto the second lined pan, making sure to set the pop down so that the stick points as straight up as possible. Repeat with the remaining cake balls. If the coating in the cup gets so low that you cannot easily submerge the whole cake ball, add more coating to the cup. 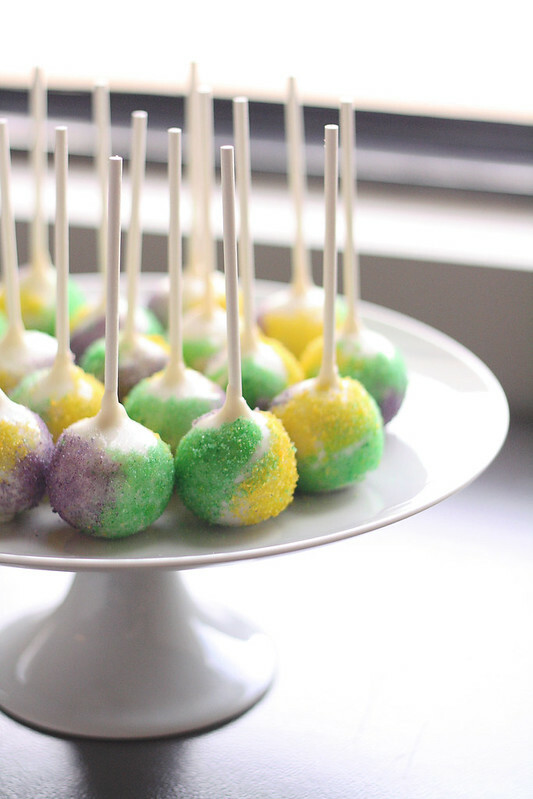 Let all cake pops dry completely at room temperature or quick-set them in the fridge. To make the colored sugars, divide total sugar evenly between 3 bowls. Add a drop of gel coloring into each bowl. Preferably wearing gloves, use your fingers to rub the color into the sugar until evenly distributed. Make sure to wash your fingers between each color. If the color isn't saturated enough, add 1 or 2 more drops. Try to avoid adding more than that since too much moisture may start dissolving the sugar or making it clump together. To decorate the cake pops with colored sugars, brush patches of the cake pop surface with corn syrup and then sprinkle areas with syrup generously with the sugar of your choice right away. Brush more of the cake pop surface with corn syrup and repeat the process with different colored sugars until the sides are covered all the way around. Let set for at least 1 hour, then enjoy! Preheat the oven to 350 degrees F. Grease a 9-inch cake pan generously with butter. Sift the flour, cinnamon, nutmeg, baking powder, baking soda, salt, and yeast into a large mixing bowl; set aside. Whisk the melted butter with the sugar, molasses, milk, sour cream, vanilla, and lemon zest. Whisk well. If the butter starts to solidify again, microwave on medium-low power for 1 minute and whisk again until everything is liquid. Add the egg, and whisk immediately and well to incorporate. Pour the liquid mixture into the flour mixture and whisk immediately to combine. Whisk until combined -- a few small lumps in the batter are fine. Add in chopped raisins and pecans, and whisk again just until evenly incorporated. Pour batter into prepared cake pan, then bake for 25 to 30 minutes OR just until a toothpick inserted near the center of the cake comes out clean. Remove from the oven, and let cool just until comfortable to the touch. Remove any hard edges, crumble and transfer the rest of the cake layer into a sturdy gallon-size zipper-lock bag OR to a large mixing bowl. Seal/cover cake until ready to use for pops. Oo, these smack of festiveness! And they are so pretty! Totally forgot about mardi gras this year! These pops looks amazing though. Would love to make them year round!